"Some days, some nights/Some live some die in the way of the samurai. Some fight, some bleed/Sun up to sun down, the songs of a battle cry." Samurai Champloo is a Comdey/Drama based off the manga by Shinichiro Watanabe and was published by Kadokawa Shoten. The english manga is published by Bandai Entertainment. The twenty-six episode anime is from Manglobe and was originally licensed by Genon, but we all know what hapened to them. Since then, Samurai Champloo was rescued and relicensed by Funimation (if only they could do the same for Paranoia Agent). The style is extremely well done. With wonderful use of color and lighting to give you the right mood at the right time, it is certainly a visual marvel. However, the animation isn't quite there all the time. There are moments where the animation does get pretty sloppy and out of place, so it can be sometimes irritating to watch. But, though irritating, the animators certainly took the time and effort into where it really counted. So, there is no way I am reviewing this anime without mentioning the music. 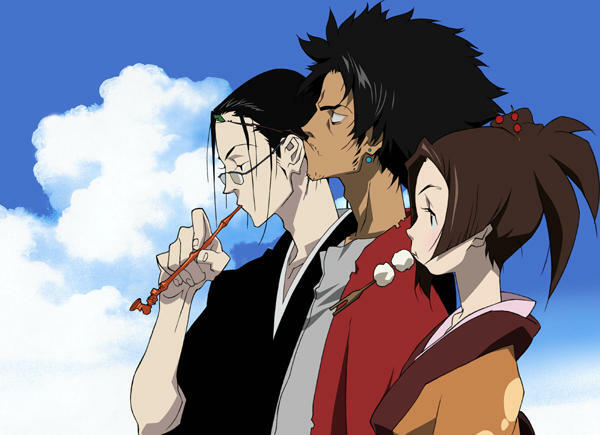 Samurai Champloo is a period piece, but the music is very very modern; from Hip-Hop to Rap to even some Reggae. The question is, however, does it work? And, well it really does. The music seems to be used at the perfect time in the series, and adds an extra touch of awesome to it. The story itself has it's major plot, to find the Sunflower Samurai, but that's not the plot of every single episode. A lot of the series is just different stories per episode, sometimes for a max of two episodes (some are labeled Part 1 or Part 2 in the title). Most of the episodes do not, in any way, fit with the time period the show is set in. However, it really does work for this series. The point of Samurai Champloo is, pretty much, a parody of Asian action/samurai films. With that idea in mind, the show may not make sense plot wise but, that's the point of it. You have the characters playing baseball in one episode, and, in another, there's a character who has beat boxing/rapping sidekicks. Yeah.... Makes no sense to the period, but it's still funny to watch. Since this show is more about our three main travelers, they'll be the subject of my little character talk. All three don't have a whole lot of development, pretty mich sticking to their stereotypes from episode one. Sure, there is backstory and a few flashbacks here and there, but they're few and far between. As for the voice acting in the Dub, all three are played perfectly. Fifteen year old Fuu is played like a fifteen year old, thanks to Kari Wahlgren (Blood+, Witch Hunter Robin). Fuu just seems to be you typical young girl who is just keeping tabs on the boys, pretty much forcing them to get along. Jin, the rather quiet and very traditional samurai, is played by Kirk Thornton (Gungrave, The Prince of Tennis). He's played exactly how you would picture this character. He's all about honor and can become rather upset whenever he comes across broken tradition with the way of the samurai. Although he is to be seen as the most serious of the three, Jin really does have his share of funny moments. But the big show stealer is most certainly Steve Blum's Mugen (The Big O, Rurouni Kenshin). In the dub version, Mugen's slang and brash way of speaking are carried out so well by Steve Blum it's not even funny (Okay it totally is). If you're looking for the man of the show then look no further then Mugen. Certainly one of Steve Blum's iconic roles alongside Cowboy Bebop. The dub itself has a few tiny problems when it comes to syncing with the character's mouths. There have been a few times where I would watch the show and see that they could be speaking in your standard Japanese turned English voice over movie. Where you have the Japanese audio going in the scene, but then that pause where there's poorly done English voice over mixed in. Luckily, it's not an extreme problem with Samurai Champloo. I'm probably just being a bit nit-picky. Also, if you want to pick between the Japanese and the Dub, my friend suggested the Dub; just for the slang and brashness of it all makes more sense in English rather then Japanese, and the voice acting works tons better. I've seen the English but haven't seen the Japanese, so I'll have to take his word for it. All in all, Samurai Champloo makes fun of your typical samurai story and adds it's own modern pieces that work really well together. The Dub is well done, using, not only one of the greatest voice actos of all time, but some other well known actors who fit their roles perfectly. Again, a visual marvel, it has fun with what it's trying to accomplish and it's easily noticeable. Certainly one of those anime you just have to add to your viewing list. AnimeMaze.com is an Online platform for watching your favorite Anime Series and Cartoon in English Dubbed. Choose from our extensive collection of English Dubbed Anime and Watch Anime online on any device in high quality. Here are options for the dubbed anime, anime dubbed, anime dub, english dubbed anime, anime english dub, watch anime dub, watch dubbed anime, dub anime and dubbed anime online.